We aim to provide inclusive training sessions that allow all levels of ability to participate. Please sign up to the mail list for the latest training details. Speed interval vo2 max session – The lighter evenings mean we are back at Haigh Hall. Meet at the top of Hall Lane off Leyland Mill Lane which is between Wigan Infirmary and the Cherry Gardens, WN1 2SG. Meet 6.30pm for warm up. There is also sometimes a track session organised too. £3.70 with Harriers membership and a Profiles card, £4 without. Details sent out on the mailing list each week. Please note we now meet in a different location (As from 23rd Jan 2018) on the main car park opposite the Cinema and Frankie & Benny’s. WN5 0UL. This is a large car park , lit & free. Meet 7pm for warm up. Please note if there is a match on at the DW on Tuesday or Thursdays then the session will be moved to Coppull Lane Swinley. Notification will be made by Email, Facebook and Twitter. Sign up to follow this blog or drop us an email and be added to the mailing list. I have just left Wigan phoenix not fit at the moment need to loose a bit of weight. Looking for a new running club and I live in Swinley. Apologies Paul, I’ve only just seen your message. We train Tuesday 6.30pm and Wednesday 7.00pm. Venues can vary according to season (just switching to Haigh on Tues) and football/rugby matches at DW Stadium. 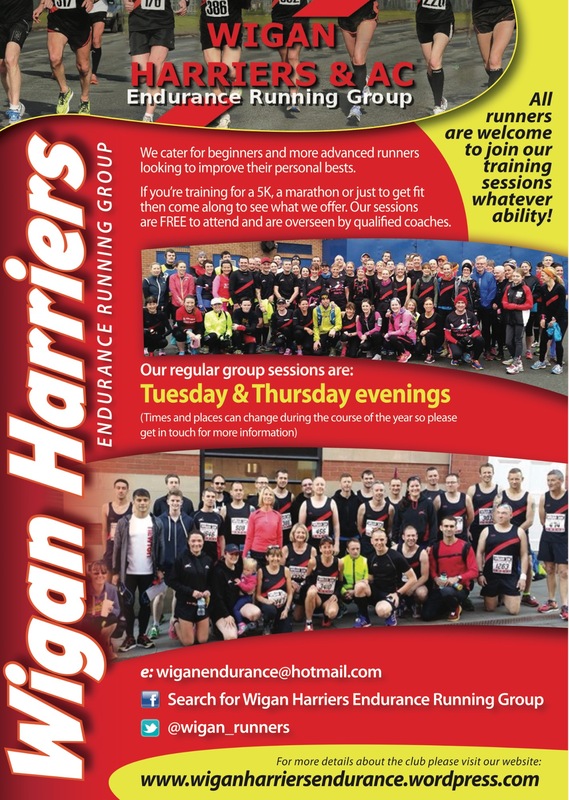 Drop an email to wiganendurance@hotmail.com for full details. Thanks.